What makes a good email signature? Your email signature is important to your corporate identity. Most people don’t think too much about their email signatures, even though it is one of the most versatile digital tools available. However, did you know that you can use an email signature for much more than just an electronic ‘calling card’? You could use it for targeted marketing campaigns, increasing your social media presence and adding to your brand management without making life difficult for your IT department. Email signatures are the perfect channel to promote special offers or big news you want to share with a large audience. If thousands of emails leave your company a day, then that’s thousands of people you can promote to without having to use avenues like email marketing or digital advertising. To help your marketing team, we've written THE comprehensive guide on turning your email signature into a valuable marketing asset, without making life difficult for your IT department. Use your email signature for promotions, social media and brand management - make every email that your organization sends a valuable marketing asset. Make managing email signatures a breeze - get consistent signatures across your organization easily. See what other marketers are doing - read case studies from some of the largest, most successful companies in the world. 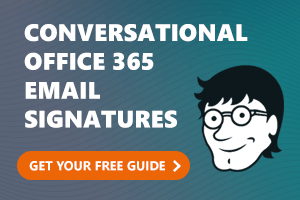 Get your free official Email Signatures for Dummies guide to see how simple it is to make your email signature do more.